You've served our country in the U.S. military, with the nation's heartfelt thanks. Now it's time to plan your future through the Post 9/11 GI Bill®, which helps veterans and eligible family members afford a college education. 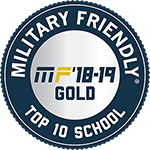 Point Park University proudly participates in the GI Bill®, including the Yellow Ribbon Program, and has been designated a Military-Friendly School® by G.I. Jobs Magazine for 2018-2019. We understand the needs of military veterans and their families, and will work with you to explore which academic program best fits your goals and career aspirations, or those of your eligible family members. At Point Park, our director of veterans services and our admissions counselors are eager to help you explore academic programs and obtain military benefits toward a college degree. Monday, November 12, 2018 Learn why veteran John Yingling chose Point Park University for electrical engineering.